10-key mechanical add-lister, electrically driven. Was also available with keys for use with the old British non-decimal d currency (see advertisement below). Prices were � 10s Sterling [about US$245] for the model 101, and �0 Sterling [about US$500] for the model 101 WS. 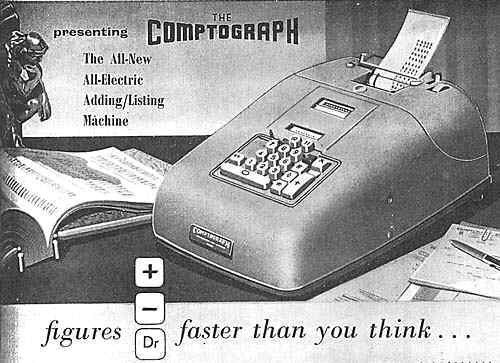 The photograph above is from an advertisement for the Comptograph (no model given) from Comptometer Ltd., in 1959. 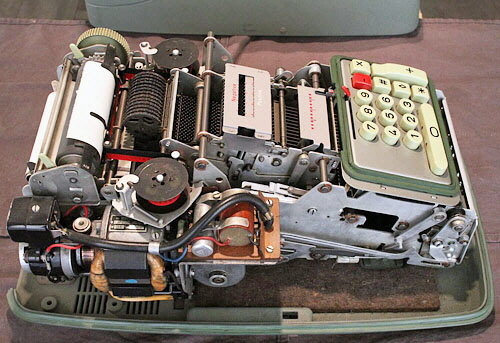 It shows a machine for use with the old British non-decimal d currency since it has extra keys marked "10" and "11" above the other keys. 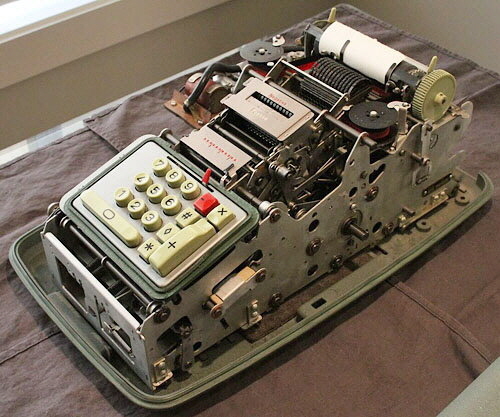 The advertisement claims that the machine features "Exclusive visi-balance window, super-fast, unusually quiet, compact keyboard, concealed paper roll, adjustable legs, non-print lever, two-colour printing, and many other features". Comptometer Ltd. in the UK. 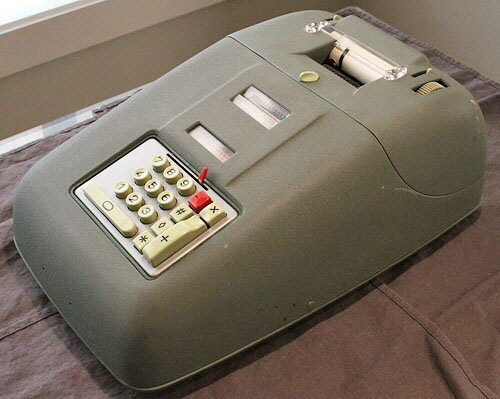 was amalgamated in 1961 with Control Systems' Sumlock Ltd. to form Sumlock Comptometer Ltd., and it is recorded that Comptograph machines were exhibited on the Sumlock Comptometer stand at the Business Efficiency Exhibition in London in October 1963. John Wolff has information that these machines were actually manufactured by Walther in Germany and rebadged "Comptometer". It is actually a Walther Model P12 - see http://www.johnwolff.id.au/calculators/Walther/Walther.htm#Printing. Comptograph 101 with the cover removed. 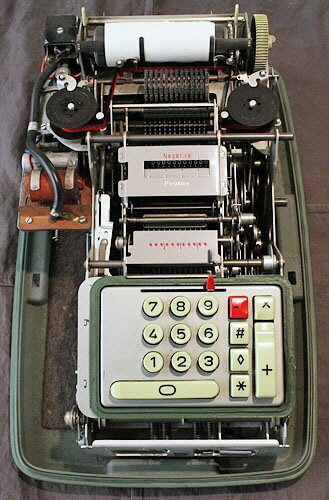 Comptograph 101 with the cover removed, giving a clear view of the 10-key keyboard. The window just below the printing mechanism is the advertised "Exclusive visi-balance window" which apparently shows the operator the current balance without having to stretch across and read it from the listing paper. 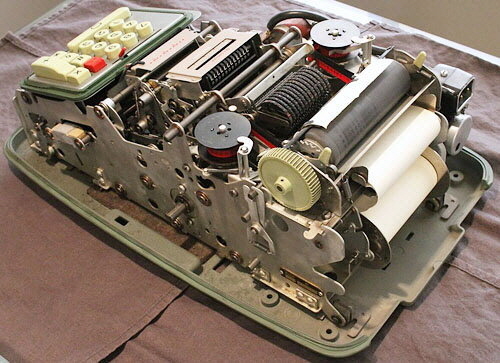 Comptograph 101 with the cover removed. The electric drive motor is on the left. Comptograph 101 with the cover removed, from the rear. Office Magazine, Vol. 6, No. 71, November 1959, front cover. "Business Efficiency Exhibition", Office Magazine, October 1963, p827.